Rev. Robert & Rev. Yvette Arevalo are the Senior Pastors of Grace Tabernacle Church. They were ordained by our G.T.C. founding Pastors in September of 2001. Together they work to lead GTC forward in the vision God has set before them. Pastor Yvette is daughter to our G.T.C. Founding Pastors Rodriguez. G.T.C. was founded on September 16th, 1991 by Pastor's Albert & Hermelinda Rodriguez. Our Founding Pastor entered his eternal home on October 15th, 2011 after serving His Lord faithfully, leaving a great legacy for all. Pastora Hermelinda continues to serve leading the Spanish Ministry & Food Pantry Ministry at G.T.C. Minister Malcolm & Sis. Maggie have served faithfully at G.T.C. for over 17 years. Rev. Malcom serves as Executive Pastor. Together Minister Malcolm and Sis. Maggie lead our Youth ministry "Illuminate Youth". Minister Ben & Sis. Fuji have served faithfully at G.T.C. for over 10 years. Both Minister Ben & Sis. Fuji serve on our Praise & Worship team. Minister Ben takes lead of overseeing Wednesday Evening Adult Bible Studies. 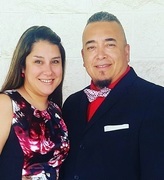 Minister Mike & Joann Lopez have served faithfully at G.T.C. for over 7 years. Together they lead our College & Career Ministry for single adults; age 18 (High School Graduates) through age 30. Minister Brian & Melissa while living in Mustang, Oklahoma have a large part of their heart here in San Antonio. Loving G.T.C. and it's mission, owning a business and having family here makes San Antonio their second home. Melissa is daughter to G.T.C. Founding Pastors Rodriguez. Rev. Brian & Melissa are the owners of Foundation Learning Center which is located at G.T.C.